ContiTech Fabchem™ (formerly sold under the brand name Goodyear) handles the majority of common industrial chemicals in pressure, gravity flow and suction applications. 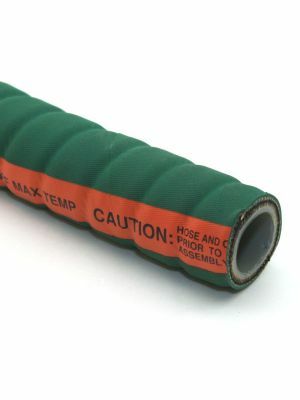 Consists of Pliosyn™ Polyethylene (UHMWPE) tube, green Versigard® synthetic rubber with bright orange longitudinal stripe, corrugated cover, and spiral-plied synthetic fabric with double wire helix reinforcement. See Catalog Datasheet for more information about this type of hose.